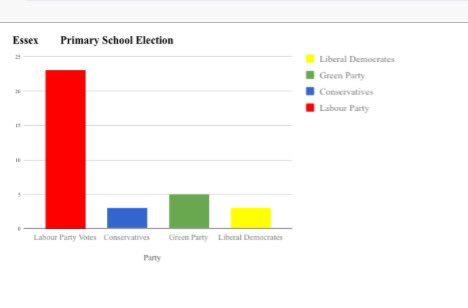 As the 2017 General Election took place across the whole of the United Kingdom, Essex Primary School was busy with its own smaller (but just as intensely fought) version. Who would be the winning party and which leader would take on the role of School Prime Minister? Children had spent the whole week learning about the British democratic process, and were enthusiastic in applying what they had learnt to the school election process. After investigating the main political parties and the election process, children created their own manifestoes and campaigned hard amongst their peers. In the election assembly we heard from the different parties. Children proudly wore coloured rosettes, waved placards and demonstrated their political knowledge gained from carefully designed cross-curricular teaching. Candidates gave speeches and read from their manifestoes, which proposed solutions for global, national, local and school-based issues. Policies ranged from protecting the rights of the individual (Liberal Democrats) to free school uniforms (Labour), and also covered environmental issues such as promoting the electric car (Green Party) and encouragement of the country’s financial and banking structures (Conservatives). In keeping with political tradition, some candidates courted the populist vote. Suggestions to knock down schools and replace them with swimming pools and slides were met with cheers, but on the whole the candidates spoke seriously and the differences in the four main parties’ aims were clear. On the day of the election, excitement was running high throughout the school. We were fortunate enough to be able to use an electronic voting system, which gave live updates displayed in classrooms as the different years cast their votes. Halfway through the voting Labour took a strong lead. Children were able to see the results progress throughout the day. The final result was announced in a late assembly, where it was declared that Labour had won a landslide victory by claiming 448 of the 692 votes cast. Head Teacher Mrs Cowan congratulated the new School Prime Minister and thanked all candidates and voters. It was the end to an exciting and educational week for our young citizens!